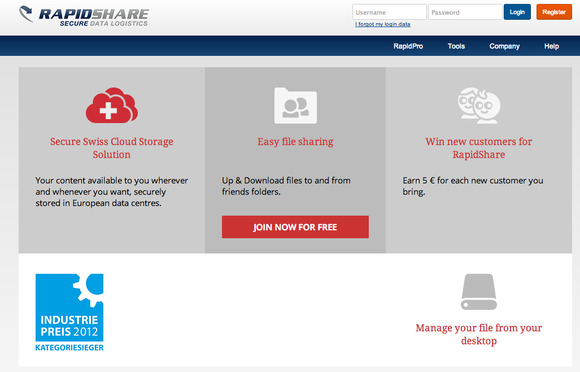 After years of legal trouble, the once-popular online file storage and sharing company Rapidshare is closing up shop. In a message posted to its website Tuesday, Rapidshare said it will stop active service on March 31. “We strongly recommend all customers to secure their data. After March 31st, 2015 all accounts will no longer be accessible and will be deleted automatically,” the message said. It did not say why it is shutting down. However, legal troubles related to copyright infringement have plagued the company for years. The company has often been spoken of alongside notorious file-sharing services like the Pirate Bay, Megaupload and Isohunt, which all have been hit with legal issues for facilitating copyright infringement. In its heyday in 2009, the Association of American Publishers considered Rapidshare the largest host site of pirated material. In 2010, six of the largest publishers of educational materials in the U.S. brought a successful copyright infringement lawsuit in Germany against the file-sharing service, obtaining a court ruling that directed the site to stop the sharing of pirated books. Legal troubles continued for the Switzerland-based service. In September 2013, Germany’s Federal Court of Justice noted that online file storage services have a business model that provides an incentive to share copyright-protected material, and ordered Rapidshare to start monitoring incoming links to look for infringing files. At that time, Rapidshare estimated it had an abuse rate of 5 percent or 6 percent, which corresponded to approximately 27,500 daily infringements, given the daily upload volume of 500,000 files. The company did not immediately respond to a request for comment, but it is likely that the paid use of Rapidshare has dwindled since it reduced access to popular illegal content, said Tim Kuik, director of Dutch antipiracy foundation Brein, in a statement. Some file storage services depend on illegal material for their income and measures against the spread of copyright-infringing content are costly, Kuik said. If those measures are effective, revenue will drop, which is the reason file storage services will often take weak measures or stop operating altogether, Kuik added.